If I didn’t have trees, there would much less colour in my garden at the end of summer. And trees improve air quality and support wildlife. Their height gives a smaller garden presence and proportion. 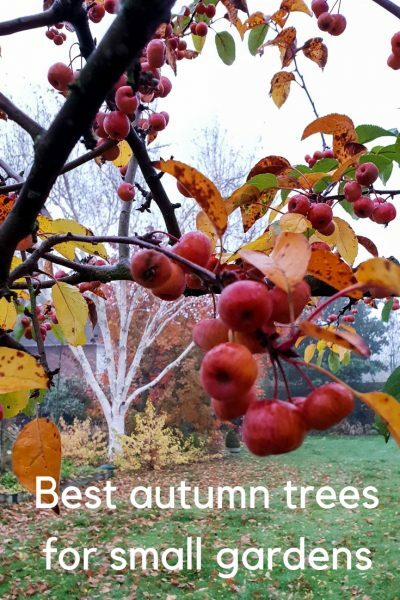 So I thought I’d round up my favourite autumn trees, in order to help you choose. The star of the show this November has been Cotinus coggyria ‘Grace’, one of the larger cotinus varieties. 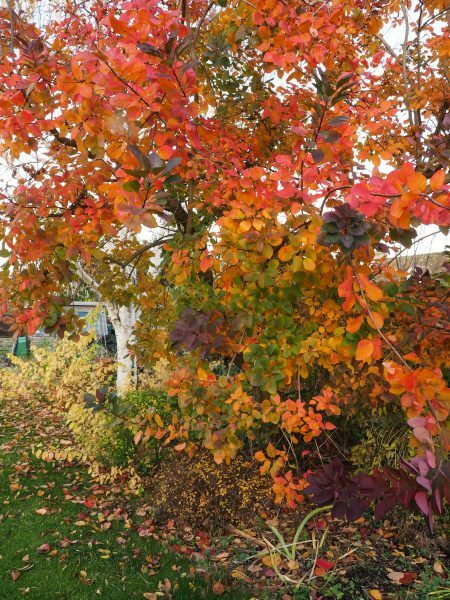 Most people grow cotinus as a shrub, but this has grown to over 20ft high and is stunning both in the summer and autumn. Another view of the Cotinus ‘Grace’. The white bark is from a silver birch. I think this crab apple is Malus ‘Gorgeous’. It holds its fruits well throughout the winter. 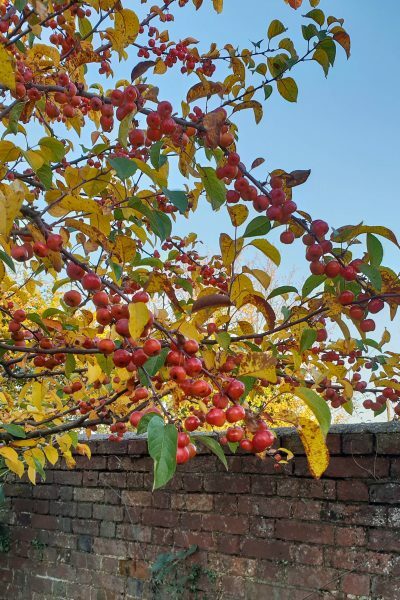 Crab apple trees are usually compact (but not always – do check!). They offer pretty blossom in spring and fruit in autumn and winter. 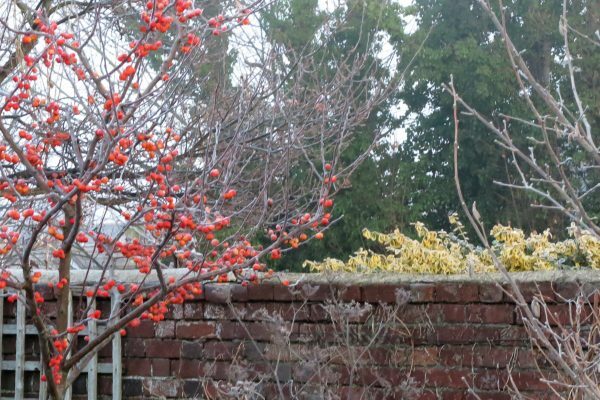 When choosing a crab apple, look for one that ‘holds its fruit well.’ This crab apple of mine still has fruit in February so it looks beautiful in frost. 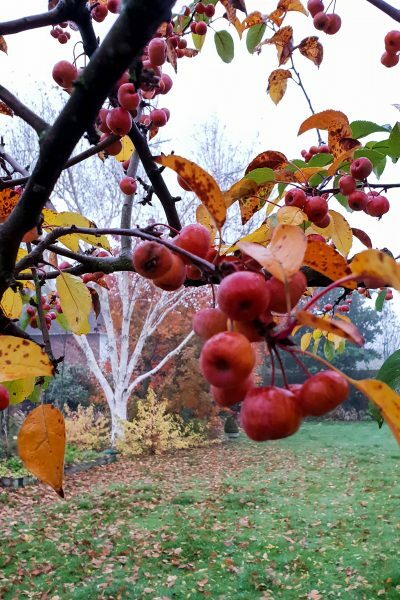 Malus ‘Gorgeous’ holds its fruit well – I think that’s my variety, but I’ve also seen it looking good in other gardens. This photo was taken at the end of January or beginning of February so this tree has really earned its place in my garden. There’s something very satisfying about helping to keep a species from dying out. Although quince, which is my next recommendation, is fast becoming fashionable. It has beautiful white blossom in spring, and then fragrant fruits in autumn. They look like a cross between a pear and an apple. 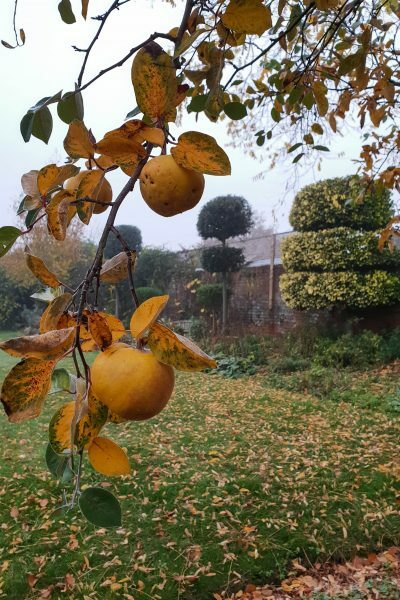 Even if you can’t face wrangling the fruits to make ‘quince cheese’ or membrillo, a bowl of quince will perfume a room for several weeks. Shaping this tree has been a bit of a struggle, but I love it now. I think it’s worth checking a young tree for shape when you choose it. Other heritage fruit trees include damson and medlar. We did have a damson, but it didn’t do well and wasn’t a particularly good shape. It’s from the plum family and they can be very fussy. Which trees have the best autumn bark? 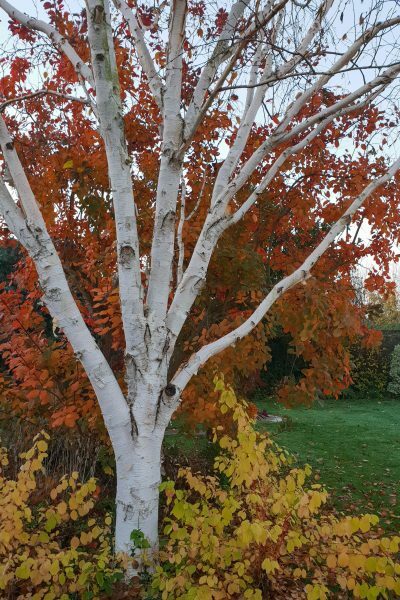 We have several silver birch (‘Jacquemontii’) in the garden. They do grow quite tall but they are wonderful trees because their pale bark is a focus point, especially in autumn and winter. The silver birch you can see has just dropped all its golden leaves. Personally I find fallen leaves very beautiful, but I suppose I will have to get them off the lawn somehow. Silver birches work well in smaller gardens because they can be pruned to be airy and light. Their roots are not very invasive. Multi-stemmed silver birches are currently beloved of Chelsea Flower Show garden designers, and they are also likely to be less tall. Just a beautiful autumn tree. The Cotinus is in the background and the yellow leaf underneath is Cornus ‘Midwinter Fire’. Soon the cornus will be bare, showing off its bright orange stems. It grows very happily under the silver birch. I wash my silver birches. (See how in the video). Since I started doing this I have had a lot of compliments – people really do say ‘what silver birch is that – it’s wonderfully white.’ When I say I wash them, they fall apart laughing. Silver birches may seem large for smaller gardens, but there is a garden near me that is around 45ft long and wide. It has three beautiful mature silver birches at the end. The lightness of the bark stops them being oppressive. 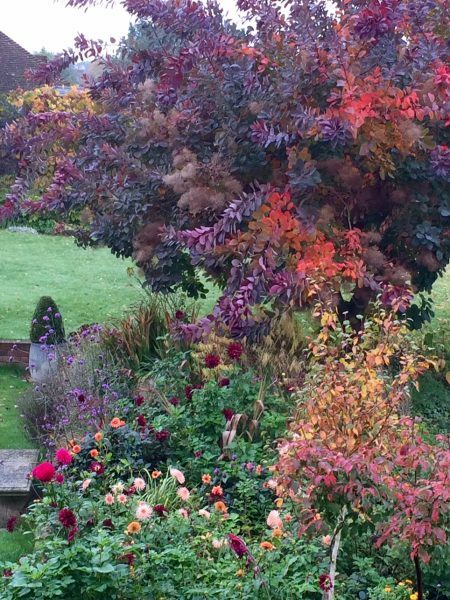 So what’s your favourite small (ish) tree for autumn colour? A friend described Acer griseum as ‘the most beautiful garden tree’. It is absolutely stunning in autumn, but I have now had three acers die in this garden so I don’t think they’re an option for me. There’s a fuller tour of the garden here in this video. If you want the super-quick tour to music, that starts at exactly two minutes in. Find out which tree is absolutely perfect for your garden. Or try Alan Titchmarsh’s How to Garden: Small Trees, where he guides you through the selection and planning of trees for small gardens. Plus how to look after them. See here for more about trees for garden privacy, or watch the video on how to position trees for privacy. 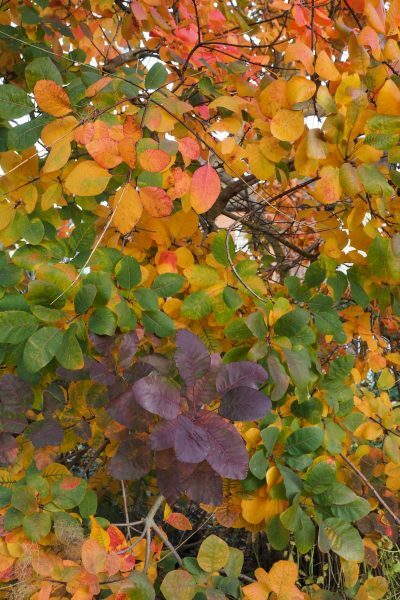 16 comments on "My best autumn trees for small gardens"
My Cotinus Royal Purple has grown much larger than expected but is definitely suited more to summer contest than autumn colour. I’d recommend Crab Apple Laura if you want good blossom, excellent fruit for jelly and autumn colour! Thank you for the recommendation – I’d love to squeeze a few more crab apple trees in, so I will remember ‘Laura’. That Cotinus is just beautiful. I just looked it up for my hot, dry climate/soil here in central North Carolina and yes! “Cultivation is best in dry, infertile soils, which keeps the growth habit ……” Well, that is what I have on the slope that is in need. So I will look into it. What gorgeous fall color! Thank you – I’m glad this comment got through, as I think you were having trouble. Thank you. It’s such an amazing time of year. Well you have cheered me up Alexandra and made me smile, washing silver birch trees indeed! But they are beautiful so if I am ever lucky enough to have one in my garden I will do the same – it does look very beautiful. I can strongly recommend medlars. They’re charming small trees, with twisting branches, an old-before-their-time look, autumn colour, big white flowers in spring, and the fruit of course. People call it an acquired taste, but I loved the first medlar I ever tasted and eat them raw every autumn. I’m currently eating my way through this year’s crop. On top of all that, they’re very unfussy about location and normally quite healthy. Oh, yes, I love medlars although I’ve never quite managed to eat them raw. I understand that when they are slightly rotten, they are called ‘bletted’ and that that’s the way they were eaten in the Middle Ages. This is said a lot, but it’s wrong and unfortunately makes people reluctant to try them. Bletted medlars aren’t rotten, they’re just very over-ripe. It’s a bit like when you have a plum or an apple and you leave it until the skin starts to wrinkle and it gets very juicy and squishy inside. It’s still edible in that state, it’s just very ripe. In the same way, you leave the medlars until the skin starts to wrinkle and the insides are very soft, but they aren’t going mouldy or decomposing at that point. If they do show signs of rotting, you shouldn’t eat them since they’ll taste pretty horrible. Amelanchier is one of my favourite small trees too. How do I go about pruning a small crab apple that has grown in an ugly lopsided way? Amelanchier is heavenly, I quite agree. 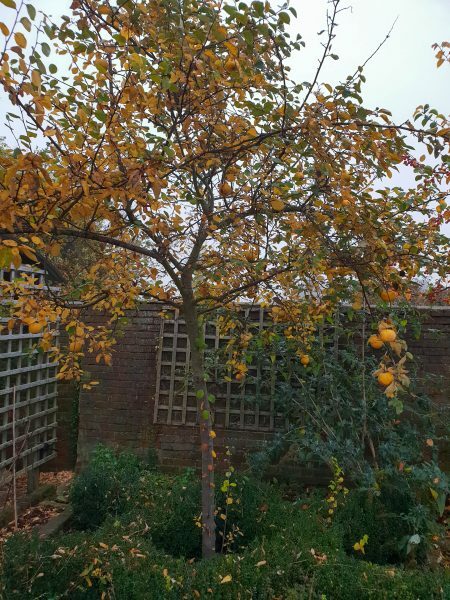 I think the only way of correcting an ugly crab apple is simply to cut off the branches that are going where you don’t want them, and to make sure you take them off nearly (but not fully) flush with the trunk or branch they’re coming from. Ie take out whole branches rather than cutting them short. Step back and look at overall shape, and after a couple of years, it should be looking better. But I’ve found it really difficult to get my crooked crap apple to look more beautiful.